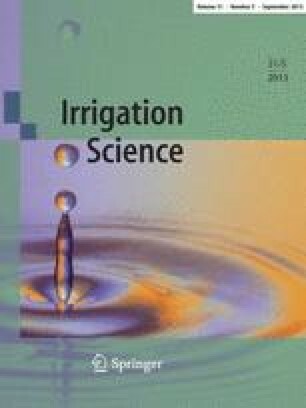 The introduction of polysaccharide producing benthic algae and bacteria could provide a low cost technique for seepage control in irrigation channels. The ability of algae and bacteria to produce polysaccharides proved to be successful in reducing the hydraulic conductivity of irrigation channel soil. Hydraulic conductivity was reduced to less than 22% of its original value within a month of inoculating soil columns with algae. Chlorophyll and polysaccharide concentrations in irrigation channel soil were measured in order to assess the growth of algae and extent of polysaccharide production, and their correlation with hydraulic conductivity of channel soil. Increases in polysaccharide occurred in the top layer (0–5 mm) of the soil column. The reduction of hydraulic conductivity was highly correlated with the amount of polysaccharides produced (r2 = 0.92). Hydraulic conductivity decreased with increasing algal and bacterial numbers. The first few millimetres of the soil core where microbial activity was concentrated, seemed effective in controlling seepage. Incorporation of extra nitrate and phosphate into algal medium did not increase the production of polysaccharides by algae in channel soil. The effect of salinity and turbidity of irrigation channel water on channel seepage was studied by measuring the effects on hydraulic conductivity of channel soils. When the electrical conductivity (EC) of the water increased above a threshold value, the hydraulic conductivity increased because of the flocculating effects on clay particles in channel soils. A relationship between sodium adsorption ratio (SAR) and EC of the channel water was established which indicated 15% increase in channel seepage due to increases in salinity. Increasing the turbidity of irrigation water (by increasing the concentration of dispersed clay) resulted in lowering the hydraulic conductivity of the channel soil due to the sealing of soil pores by dispersed clay particles. When the turbidity of the water was 10 g clay l−1, the hydraulic conductivity was reduced by 100%. An increase in clay concentration above 1 g l−1 resulted in significant reduction in hydraulic conductivity. Soil bowl experiments indicated that clay sealing with a coating of hydrophobic polymer on the surface could also effectively prevent seepage of saline water.